Zone boarding will soon be a thing of the past for Delta customers. From January 23, 2019, Delta will introduce boarding by branded fare purchased on all global flights, bringing consistency, simplicity and clarity to the gate and boarding experience. 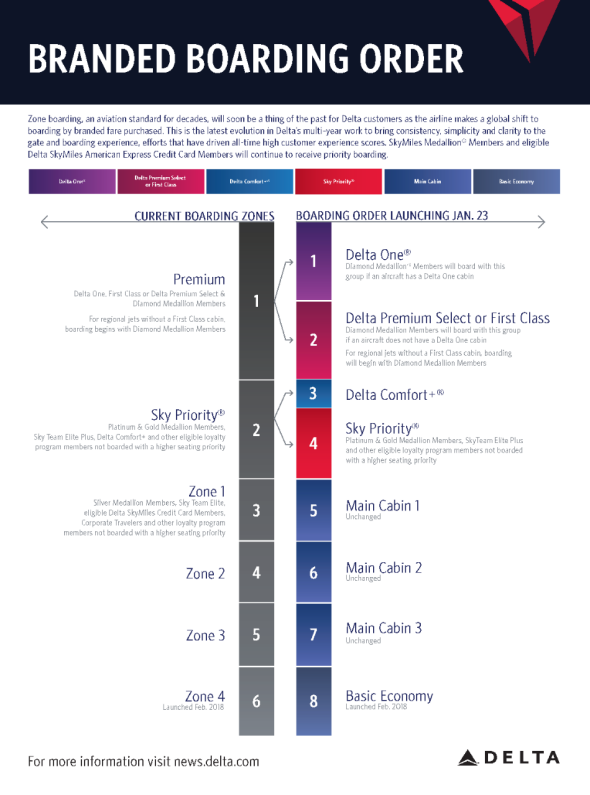 The boarding order change will be accompanied by a color scheme distinguishing Delta’s fare products: Basic Economy, Main Cabin, Delta Comfort+®, Delta Premium Select/First Class and Delta One®. Each fare, in addition to Sky Priority®, will have a specific color – from booking through boarding. SkyMiles® Medallion® Members and eligible Delta SkyMiles American Express Credit Card Members will continue to receive priority boarding. Boarding zones for Delta-operated flights worldwide will be renamed to reflect the branded fare purchased, while still prioritizing customer loyalty. The number of boarding groups will increase, requiring fewer passengers to line up in the gate area at any one time. For further details please visit Delta News Hub.